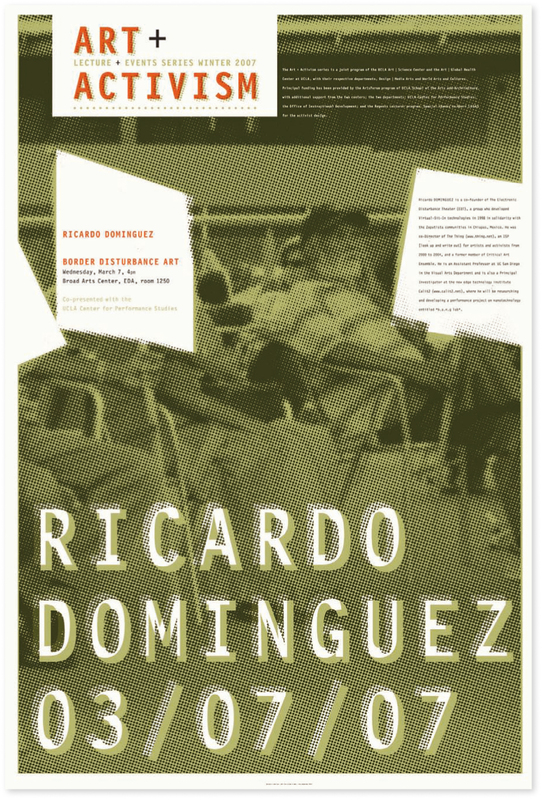 Ricardo Dominguez is co-founder of Electronic Disturbance Theater, a group that developed virtual sit-in technologies in 1998 in solidarity with the Zapatista movement in Chiapas, Mexico. From 2000 to 2004, he was co-director of “The Thing,” an Internet service provider for artists and activists, and is currently a former member of the Critical Art Ensemble. He is an assistant professor in the visual arts department at the University of California, San Diego, and is a principal investigator at the new-edge technology institute Calit2, where he will be researching and developing a performance project on nanotechnology entitled *b.a.n.g lab*. This lecture was co-presented with the UCLA Center for Performance Studies.